Namibia is brimful of craft markets and you’ll be sure to find many of them on your travels throughout the country. Keep an eye open as you enter some of the small towns, as craft markets are usually found there. There are also monthly and annual markets to check out. Most of them offer something a little different from the community craft markets, but no doubt all of them will provide you with something special to take home! This craft market is Okahandja’s best known tourist attraction. 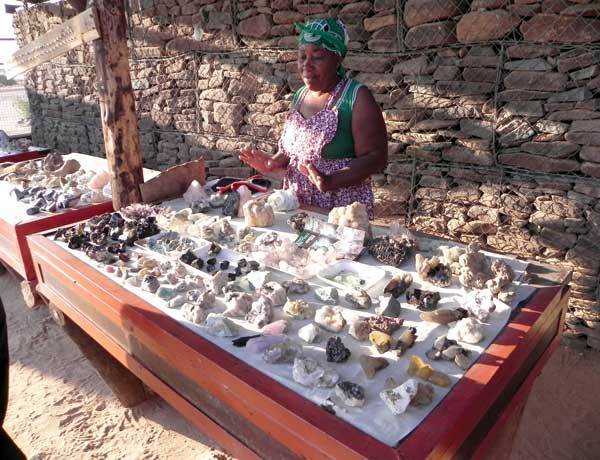 Woodcarvers from all over, and as far as the Kavango Region of north-eastern Namibia, who practice their ancient skills come here to sell their goods. Since wood is not resistant to the wear and tear of time, wood sculptures survive less well than other forms of art and are therefore an important hidden element in the art history of many cultures. The wood-and-thatch market is situated next to the main road at the town’s entrance and exit. Choose from a wide variety of hand-carved wooden artefacts such as animals, bowls or jewellery boxes. This market is situated at the Spitzkoppe turnoff along the B2 between Usakos and Swakopmund. For over a decade the market consisted of only a few stands run by hardy, small-scale miners, until in September 2010 it was endorsed and inaugurated as a proper facility by the Namibian Government in conjunction with the European Union and the Rossing Foundation. 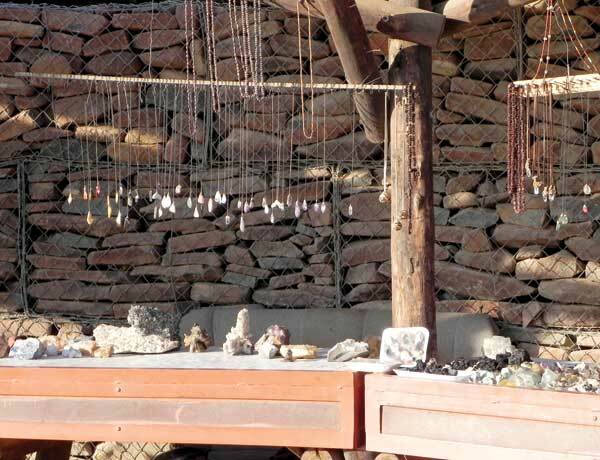 You’ll find an impressive collection of semi-precious stones, crystals and minerals at this market. Many people believe that crystals have healing powers. Whether or not you agree, they’re always a pretty sight, especially when the light passes through them. The market is open 7 days a week from 7:00 – 19:00. If you’re looking for an alternative Saturday shopping experience, Vineta Market is the place to go. Entrepreneurs who cannot afford shop rental and marketing expenses have the opportunity to display their goods here. The marketers come from all over, even as far as Otjiwarongo! You’ll find an array of homemade goods, baked treats, plants and books, to name a few. 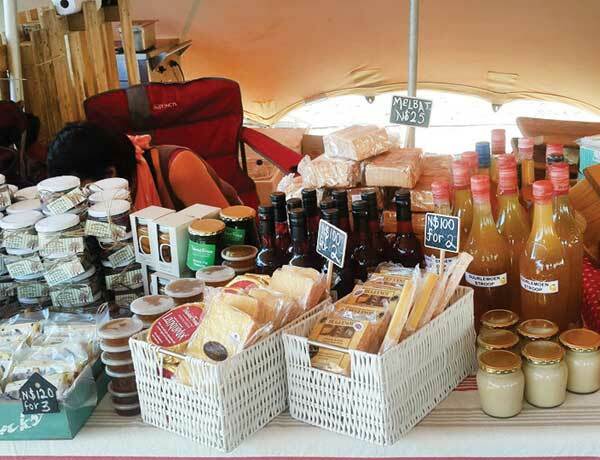 The market takes place on the last Saturday of each month in front of Woermann Brock Vineta from 8:30 – 14:00. 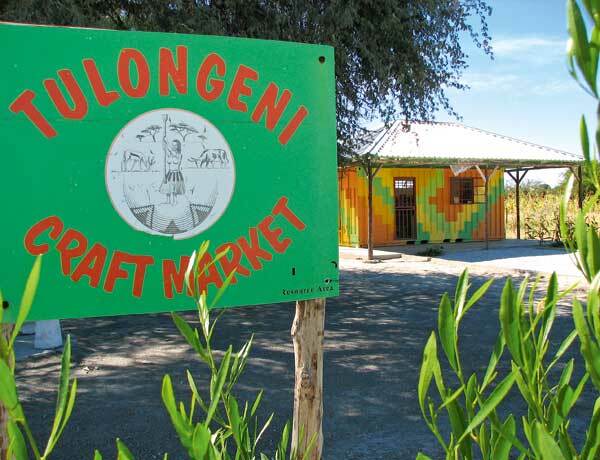 If you’re on your way to or from Etosha on the B1 south of Ondangwa, you can’t miss the small and brightly painted Tulongeni Craft Market, which is a formal Owambo community craft centre. Women from the Onenongo Village use their knowledge and skills to make pots from clay that they collect from the oshanas (flood plains). These pots can be bought at the market as well as a good range of wooden stools, superbly crafted baskets and other items. Selecting a basket means you take home a piece of Owambo tradition. Baskets still play a big role in homesteads as implements to separate grain, as storage and portable containers and platters to eat from. The market is situated 85km south of Ondangwa in Omuthiya. A new addition to the Namibian events calendar is the monthly Windhoek City Market. This is a food, wine and goods market that the whole family can enjoy. If you find yourself in Windhoek during December you should go to the Christmas Tasting Festival at the United Sport Grounds. Tickets can be bought through Computicket. Certain traders will offer free tastings that range from wine and cheese to ice cream and much more. You can buy lots of interesting knick-knacks such as jewellery, art and handmade gifts. For more on the WCM and the next market dates see their Facebook page at www.facebook.com/windhoekcitymarket.